I'm a lover of words still learning to use them. "I’m going for a walk" is a statement that has likely been said over a million times in my parents’ house. We said it in the best of weather and we said it in the worst of weather. When I was sixteen and prone to sulkiness, I would add an exclamation point and a door slam to it. Snow, rain, heat wave and what have you, to go for a walk meant to clear your head, stretch your legs, see what’s out there and hopefully run into somebody good. There’s the empanada lady’s beef empanadas off the corner of Smith and Sackett; rainbow cookies from Court Pastry; two-bite prosciutto balls from Esposito’s (now that Joe’s S_perette is gone); peanut butter and honey smoothies from Nectar; mini-spanakopita from Sahadi’s; homemade blueberry pop tarts from Smith Canteen, a new addition; macarons from Sweet Melissa’s; panelles from Ferdinando’s; dumplings from Eton; tacos from Oaxaca. But for me, nothing says “I’m going for a walk” quite like the walk to get some fresh mozzarella (and a crusty seeded twist to marry it with and rip apart). It’s my favorite snack and I know where to get it. Caputo’s Fine Foods has been making their homemade mozzarella since 1973. Also: fresh ricotta, handmade pastas, sauces, soups, antipasto and comfort foods like lasagna, chicken cutlets and eggplant parmigiana. They sell breadsticks, cold cuts for sandwiches, imported oils and bottled anchovies, coffee beans, olives, preserved peaches and more. Lots more. Neighborhood-sick customers are pulling out of their driveways every day to make the trip from Jersey, Virginia and Pennsylvania; stores like Caputo’s are few and far between. And not everyone wants to stomach the maze of a tourist trap that is Eataly. 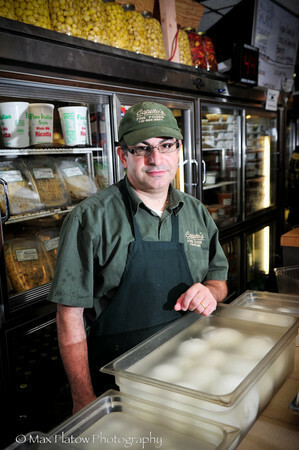 Second-generation owner Frank Caputo, 49, runs the business today, but its history begins with his father, Giuseppe Caputo – the original mozzarella master who moved his family of four from Bari in Italy to Brooklyn in 1972 with hopes of opening a store that would make him enough money to buy a nice, little house back in Italy. He’d had the same kind of business there – a store that saw him in a shirt and tie – but with his mother, sisters and one brother all living in Brooklyn, he thought he’d give business in the States a shot. If it didn’t work out, they’d go back home. Giuseppe, his wife Flora, and their two sons, Frank and Vito, lived on Nelson Street between Court and Clinton for about a year until they relocated to the apartment above the store. (The building went up for sale and although Giuseppe paid double its market value, it was a good thing he did, Frank says.) But leave it to the pesky, old Italian ladies who left the Caputos no other choice but to pack their bags (again) and split for Gravesend. Despite the move, Frank and Vito still spent a lot of time in Carroll Gardens. Frank’s love for food – cooking it, eating it, talking about it – was born in the store. It’s where he learned how to make cheese; it’s where he practiced his pasta. The decision to carry on the family business, however, was his choice entirely, and it didn’t happen right away. In the Caputo household, if you wanted to work in the store, then you had to go to college. College first; Caputo’s second. Frank graduated college with a degree in computer programming. Two weeks before he was about to start a job at Chase, he called to say he’d changed his mind – that he was going into the family business. He may love the store now, but twenty-five years ago, Frank and Vito went looking for a change. So the brothers came back to the store. They worked for twenty years alongside their parents until the curd was officially handed over to Frank in 2001. Vito, having grown tired of the business, moved to Uruguay with his girlfriend. I grew up on Polly-O, but I can’t eat the supermarket, factory-made mozzarella anymore. Not with Caputo’s a few blocks away. It’s just too dry and rubbery for me. Frank is super picky about the curd he uses and there’s really no comparison when it comes to quality. (Unfortunately, his distributor is tight-lipped on the farm from which it comes.) Stretching out a batch every 90 minutes or so, Frank has three hours (according to the health department) to sell it fresh. Once you refrigerate cheese, the fresh-o-meter goes down because it dries out, changing its texture. (Frank will use that cheese in his lasagna and ravioli fillings.) There’s a bit more waste involved in his process, but in the end the mozzarella kneads up so moist and creamy that it will melt into the contours of the plastic container you’ve carried it home in. Once home, plop it onto a cutting board and get slicing. Frank’s pastas are so beautiful that you’ll want to collect them all when you’re there. One minute you’re holding the orecchiette and the next minute you’ve spotted the cavatappi. Should you try the basil tomato fettucine or stick with your usual spinach spaghetti? Torteglioni or ditalini? The choices are endless. There may be competition around the neighborhood but Caputo’s welcomes it as it keeps them on their toes. Caputo’s won’t cut corners, but I’m about to cut mine and go for a walk. Who’s coming with me?